Santa Rosalia’ s celebration is going to start!! 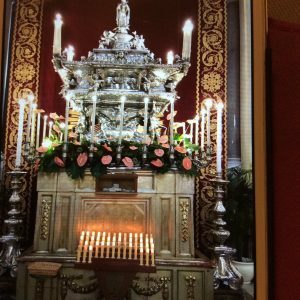 Palermo and its citizens are going to celebrate their Patron Saint,Rosalia ,who saved the city from the plague on 1624… And since then …every year Palermo turns to be the most popular scene of devotion and tradition! A huge parade with thousands of people will be following the big charriot where Rosalia statue will be standing blessing Palermo and its citizens!! Share with me such strong emotions!! Enjoy A day tour in Palermo city! Make such an exciting experience to feel the atmosphere of different cultures,people and flavors which make Palermo city unique! I ll guide you around to let you enjoy and appreciate such an interesting city rich of history and monuments which reveal a glorious past! We’ll share such an emotion! 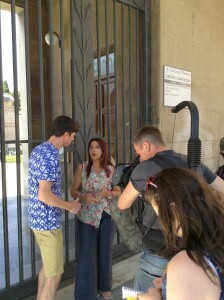 Catacombs and BBC in Palermo! Today it has been a great experience! Shooting an interview to me in the Catacombs of Palermo city! The BBC program is for children from 6 to 12 years old and the visit to the Catacombs such as my explanations about it were tailored made to this age! It has been very exciting to perform the rule in such a kind of joke to make the visit funny and not so serious!!! The two actors were fabulous ,they knew how to make the subject amusing and interesting to catch children’ attention! This special place,the Catacombs,is full of emotions ’cause these embalmed bodies were true persons and they are mirror of their age and habit of the past centuries.It’s rather impressive to see men,women,children embalmed and put into niches like mummies…they are mummies! So, another opportunity to share my great experience with you! Come and visit the Catacombs guided by me! 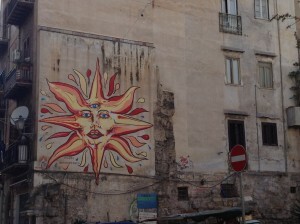 Posted in Luoghi, News	| Comments Off on Catacombs and BBC in Palermo! the Street Art and the Writers! Colourful graffiti ,faces,strange figures ,mirror of an hidden culture which is becoming more and more popular! Street Art characterizes the old quarters of the city, walking in the streets among the old buildings …. a fantastic graffiti comes out on the wall and it speaks to you whispering the existence of a New Art who denounces an alternative way to express the inner thoughts and idea of a way of living. 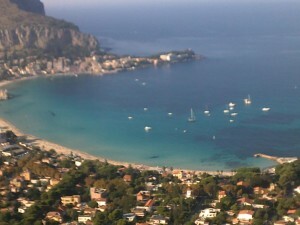 Come to discover the other side of Palermo Art! In Palermo,few days ago took place a very interesting symposium on Islamic Art sponsored by Virginia Commnwealth University(USA),VCU Qatar,Qatar Fondation and Hamad bin Khalifa University. The experience, to attend the symposium based on such high level of studies about this subject ,was very exciting to me and I had the great opportunity to meet many people very knowledgable about Islamic Art and Culture. In a sort of way,it was the chance to share our different but, at the same time, very similar culture and art ,guiding them to visit Palermo heritage of arabic style such as Cappella Palatina,San Giovanni Eremiti, Zisa .. I had a great emotion to see strong feelings in their eyes gazing at the details of the wonderful monuments of islamic art of Palermo. 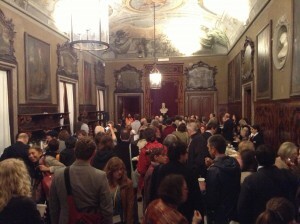 The closing of symposium took place at Butera Palace ,a beautiful baroc palace,where I explained the story about the owner family and about the artist who enriched the palace…and to me, to speak to such an important audiance…that it was an experience!! 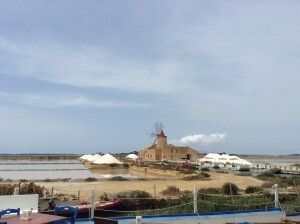 Sitting in front of the Salt pans of Marsala,enjoying the beauty of a such incredible miracle of nature…salt in the seawater harvested and collected making a pyramid of salt! The landscape is almost unreal…cones of white salt and windmills characterize the skyline of this side of Sicily…Stagnone Sea…is closed by small islands among them Mozia is the most important archeological Phoenician site . Sitting ,wondering and enjoying such a beautiful place! Come and share with me such a feeling! 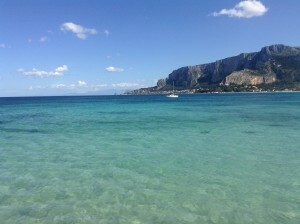 Palermo is a fascinating city,between the GoldenValley Mountains and the big golf,it ‘s a phoenician site founded in VIII c. B.C,Palermo is a perfect setting to enjoy your summer vacations. The breeze of the Thyrrenian Sea blows through the narrow medieval streets,through the amazing dancing halls of the rich Baroque Palaces,through the charming maiolica terraces on the bay,shaking the Palm trees and spreading the scent of the Zagara flower all over …making Palermo city magic and unique! 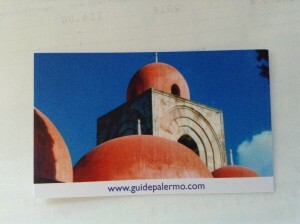 Come to Palermo and let’s discover such an exciting city,guided by me!..your private licenced guide! Posted in Luoghi	| Comments Off on Palermo,why not? Palermo always surprises me!!!. It’s a city where narrow streets,fascinating monuments,rich old palaces are the mirrow of a such glorius past, powerfull and important city in the middle of the Mediterranean Sea. On the contrary,sometimes, I fell like nothing will change in this city…but suddenly I find out an unexpected side of the city itself..something that I would have never imaged..about it…Palermo is going to be the Italian Capital for the Gay Pride on 22sd June 2013!! and I found out that Cosimo Scordato ,an open minded priest, takes a meeting with gays,lesbos and Transexuals in his church,San Saverio church ,every Wednesday in order to read and to study the Bible to find out any references to omosexual world…and moreover… the first Arci Gay Club of Italy was born in 1980 in Palermo city..!! So,wellcome Gay Pride in Palermo city…a city gay friendly..!! What an exciting experience enjoy Aida ,Giuseppe Verdi ‘s lyric,in Palermo Opera House which is dedicated to Giuseppe Verdi! Aida ,Giuseppe Verdi’s opera wrote in 1870 and first performed in 1871 in Al Cairo Opera House for which, Verdi wrote the opera itself, it is one of the most amazing and impressive italian lyric. The majesty and the elegance which characterize the liberty style decorations inside Palermo Opera House match so well with the fabolous scenery of the opera Aida. Come and enjoy the experience of a such wonderful opera and let ‘s discover the treasures of Palermo city with me! Your private guide! This morning,strolling through tha faboulous and colourfull market, I bought a beautiful broccolo and some fava beans. I put fava beans(dried one) in the water for 12 hours,then I strain the water off and I put fava beans to boil in the water adding slices of onions and salt. When fava beans are cooked, creating a sort of cream,you add a little bit of vergin olive oil ,sicilian one ,from Castelvetrano or from Cefalù (one of the best local production)..and it’s done! Did you know that Romans believed that fava beans were ancestors’souls ? ..and here comes the true Palermo tradition on 2nd November(Deceaseds Anniversary) when parents give presents and fava beans to their children in order to remember and to keep their dead relatives’s memory alive in the new generation ‘one. Would you like to experience sicilian food and tradition?